POWER, MICHAEL, Roman Catholic priest and bishop; b. 17 Oct. 1804 in Halifax, second child and eldest son of William Power, a sea captain, and Mary Roach; d. 1 Oct. 1847 in Toronto. Michael Power’s parents had both immigrated to Nova Scotia from Ireland and settled in Halifax, where they married. On the advice of Edmund Burke*, the bishop of Quebec’s vicar general in Nova Scotia, their son Michael prepared for the priesthood. 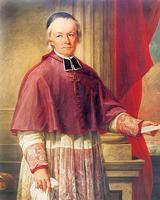 After studies in Montreal and Quebec, he was ordained in Montreal on 17 Aug. 1827 by Bishop John Dubois of New York. Power was then appointed missionary at Drummondville (1827–31) and subsequently served as pastor at Montebello in the Ottawa valley (1831–33), at Sainte-Martine, near Valleyfield (Salaberry-de-Valleyfield) (1833–39), and at La Prairie (1839–42). During the last posting he was also vicar general of the diocese of Montreal. 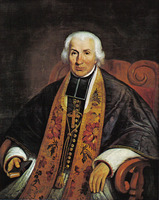 While he was at Montebello, his bishop, Jean-Jacques Lartigue of Montreal, acting on the request of Bishop Alexander McDonell of Kingston, entrusted him with the nearby Catholic missions on both sides of the Ottawa River, including the Upper Canadian missions of Plantagenet, Hawkesbury, and Pointe-à-l’Orignal. Much to McDonell’s regret, however, Power refused to attend the south side of the river. 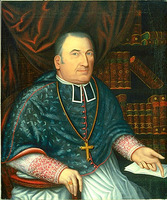 In the spring of 1841, McDonell’s successor, Rémi Gaulin*, began to seek some assistance in the ecclesiastical government of his vast diocese, which covered all of Upper Canada. He wanted a division of the diocese, whether by the appointment of an auxiliary bishop or by an absolute division, or at the very least the selection of a coadjutor bishop. Noting in a letter to Bishop Ignace Bourget* of Montreal that the province would become more and more Irish, he suggested that Michael Power be appointed to the new bishopric: “This gentleman is sufficiently Irish to be well thought of here and sufficiently Canadian to live up to all we might expect of him.” Power would, he believed, be perfectly acceptable to both Rome and London as well. Archbishop Joseph Signay of Quebec and Bishop Pierre-Flavien Turgeon*, his coadjutor, immediately issued a letter certifying to the 36-year-old Power’s good character and worthiness for the episcopate and recommending him to the Holy See. 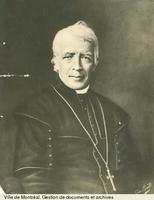 In May 1841, accompanied by Father Power and Father Joseph-Octave Paré*, Bishop Bourget travelled to Europe, where the proposed division of the diocese was favourably received by both the pope and the Colonial Office. On 17 Dec. 1841 the new diocese, covering the western half of Upper Canada, was erected and Power chosen as its first bishop. He was left free to select his episcopal city and to recommend the exact border between his diocese and Gaulin’s. The papal bulls of the bishop-elect arrived in March 1842. Subsequently Rome agreed to his choice of Toronto as his see and to the proposed line of demarcation between the two dioceses. On 8 May 1842 Power was consecrated in the parish church at La Prairie by Bishop Gaulin assisted by bishops Bourget and Turgeon. He arrived in Toronto on 25 June to be formally installed in his new diocese the next day. In 1842 the diocese of Toronto included some 50,000 faithful; in the city of Toronto there were 3,000 Catholics in a total population of about 13,000. The diocese was served by 19 priests, 16 of whom attended its first synod, held in October 1842. Four of the clergy were French Canadian, among them Jean-Baptiste Proulx* at Manitoulin Island, while most of the others were of Irish or of Scots extraction, including vicars general William Peter MacDonald at Hamilton and Angus MacDonell at Sandwich (Windsor). The first synod adopted a series of regulations of a disciplinary nature designed to establish the new diocese and its parishes on a firm footing. Pastors were not to wander outside of their assigned territories, confessional boxes were to be provided in churches, private confessions were forbidden except for the deaf or sick, no fees were allowed for the administration of sacraments, baptismal fonts were to be erected and baptismal registers kept, private baptisms were forbidden in most instances, and the consent of parents was required for baptisms of children except where a child was in danger of death. No marriages would be allowed in private homes and immigrants wishing to marry were to be thoroughly investigated. Pastors must reside in their parishes and the permission of the bishop would be required for an absence of one week or more. Clerics were to be very careful in their dealings with women and must always dress appropriately. The Roman missal and breviary were to be used in the diocese, Butler’s catechism being the standard text in English-speaking missions and the Quebec catechism in French-speaking missions. As of 1 Jan. 1843 priests were to hold duplicate ledgers for baptisms, confirmations, marriages, and burials. Power had wasted no time in providing his new diocese with dynamic leadership. In August and September 1842, shortly after his arrival in Toronto, he had undertaken his first pastoral visitation, to Penetanguishene and Manitoulin Island, and to the western part of the diocese in Amherstburg, Sandwich, and Tilbury. During the course of his episcopate he had to cope with several unworthy clerics and did not hesitate to threaten and apply harsh punishment. One of his important achievements was the foundation of St Michael’s Cathedral in Toronto. Construction began in April 1845 according to plans by William Thomas*. Although Power lived to see the completion of the nearby bishop’s palace, which was blessed on 7 Dec. 1846, the cathedral was not dedicated until 29 Sept. 1848, nearly a year after his death. While pastor of La Prairie, Power had been instrumental in establishing the Society of Jesus in his parish, an order that was only then returning to Canada [see Clément Boulanger*]. In the autumn of 1842 he asked the general of the Jesuits for men to assume direction of the Indian missions in the western and northern parts of his diocese. When the priests Pierre Point and Jean-Pierre Choné finally arrived in July 1843, they went immediately with their superior, Jean-Pierre Chazelle, to the parish of L’Assomption at Sandwich, which was to serve for some years as the order’s base of operations in the diocese. The Jesuits remained based at Sandwich, while developing their missions, until 1859; they left when Bishop Pierre-Adolphe Pinsoneault* of London made Sandwich his episcopal see. By 1847 there were 25 priests in the diocese of Toronto; of the 10 who were French-speaking, 7 were Jesuits. The numbers were not adequate to the need, however, and in January 1847 Power left on a six-month visit to Europe, seeking to recruit additional priests and also to raise money for his cathedral. While in Ireland he arranged for the Loretto sisters to establish a mission in Toronto [see Ellen Dease*, named Mother Teresa]. He also witnessed the famine that was driving unprecedented numbers of Irish to emigrate. More than 90,000 landed at Quebec in 1847. Typhus was rife among them and spread to the Canadian towns that welcomed them, including Toronto. Power contracted the disease while calling on some of the victims and succumbed to it on 1 Oct. 1847. He was 42 years of age. Though his episcopate was short, the first bishop of Toronto had through his energetic administration laid the foundations for a flourishing diocese. It is fitting that his effigy, sculpted by John Cochrane, should adorn the main entrance to St Michael’s palace in Toronto. He was eventually succeeded in 1850 by Armand-François-Marie de Charbonnel*. Michael Power, Constitutiones diocesanœ in synodo Torontina prima latœ et promulgatœ (Toronto, 1842). ACAM, 255.102, 833-4, -7, 841-3, 842-4, –5; 255.104, 841-1, 843-6, -8, 847-3. Arch. of the Roman Catholic Archdiocese of Toronto, LB 02 (Michael Power, letterbook, 1842–65), Power to Angus MacDonell, 18 April 1843; Power, circular letter to clergy, 25 Aug. 1845. Gérard Brassard, Armorial des évêques du Canada . . . (Montréal, 1940). Robert Choquette, L’Église catholique dans l’Ontario français du dix-neuvième siècle (Ottawa, 1984). Jubilee volume, 1842–1892: the archdiocese of Toronto and Archbishop Walsh, [ed. J. R. Teefy] (Toronto, 1892), 107–40. Robert Choquette, “POWER, MICHAEL,” in Dictionary of Canadian Biography, vol. 7, University of Toronto/Université Laval, 2003–, accessed April 24, 2019, http://www.biographi.ca/en/bio/power_michael_7E.html.